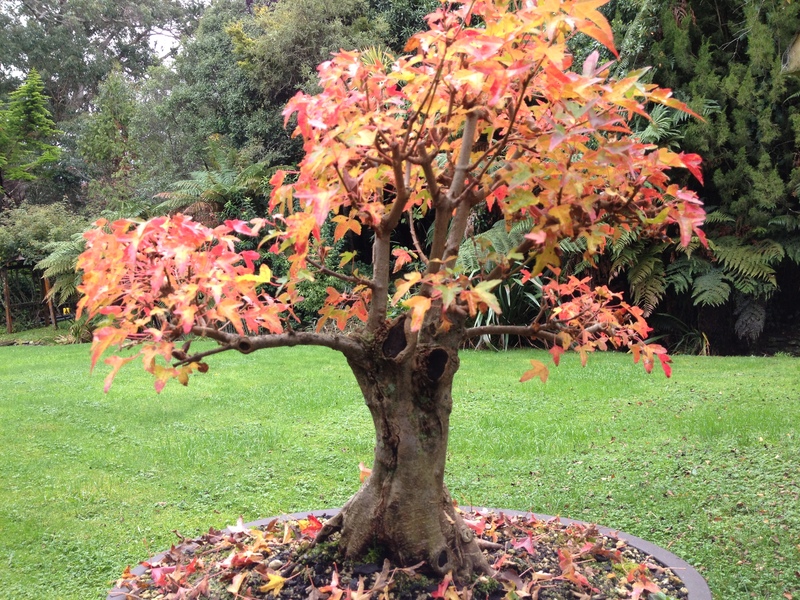 For us in the Southern hemisphere the leaves of our deciduous Bonsai trees are starting to change color and they will soon be on the ground. In the Northern hemisphere Spring growth is to be seen everywhere and I have noticed a proliferation of photos indicating just that on Social Media. The difference is that the daylight hours are getting less in the South and the opposite is happening in the North. Suffice to say then that it must be the availability and intensity of light that triggers these phenomena. Today I would like to explore the color changes in leaves during Autumn. We know that there is a pigment in leaves called chlorophyll. It is the site where photosynthesis takes place in leaves. This is the process where water and carbon dioxide gas with the aid of light energy is converted into sugars for plants to use as food or to be stored. As the days (light) get shorter, there is not enough light energy for photosynthesis to take place at optimum levels. The trees must rest and basically shut down and the only food available to get through winter, is what is stored. As this progresses, chlorophyll disappears from the leaves and the bright green fades away. Chlorophyll is not the only color pigment in leaves. As the green fades, the other color pigments become visible. These are the yellows and orange colors (carotenoids). In some trees, like maples, the glucose produced during photosynthesis gets trapped in the leaves and the sunlight causes the leaves to turn this molecule into a red color. It is known that the cooler temperatures have a role to play in this. There are other pigments present as well. Red anthocyanin pigments can also be produced during this time. Currently, my trees, and especially the Maples, are not showing the bright red colors yet. This is late for this time of year. Our night time temperatures have not dropped sufficiently for this to happen. Other climatic factors play a role as well. 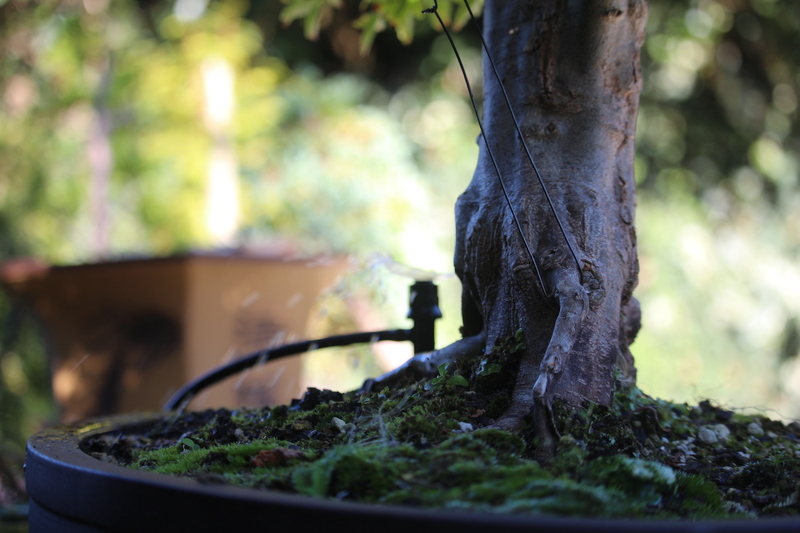 What is needed for all the splendor of autumn to show in our Bonsai trees is a warm, wet Spring, followed by a Summer with average temperatures and an average rainfall as well as an Autumn with many sunny days and relatively cold nights. 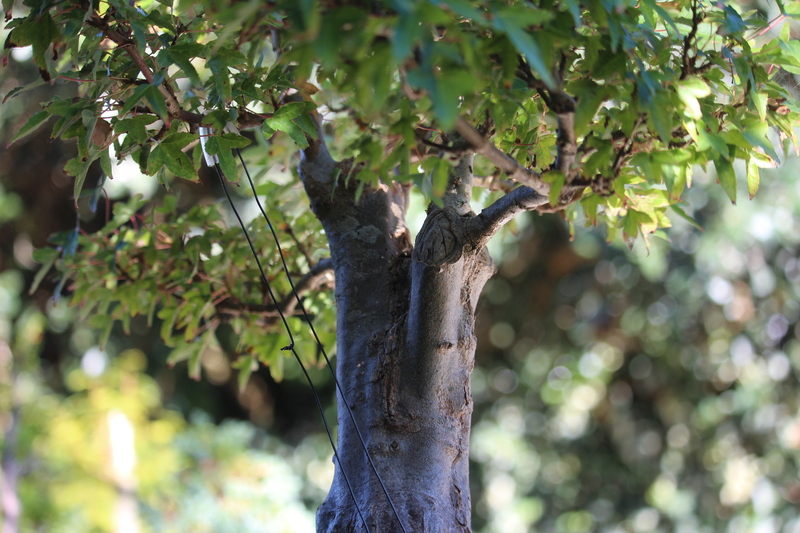 There is nothing we can do about any of these except for controlling water, but it might be possible to shift trees in one’s garden during Summer and Autumn to make use of micro-climates caused by other plants and the layout of your garden. 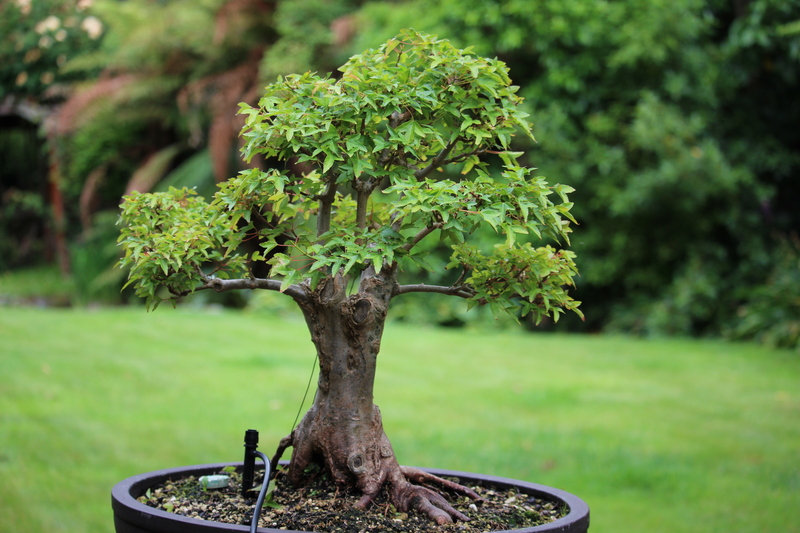 This Acer stands 35 cm tall and is still very much in training. This photo was taken in May 2013 and it shows the tree in full Autumn splendor. Soon after this photo was taken the tree lost the last of its leaves and the branch structure can clearly be seen here. The branch on the right is too straight, but the tree does need a bit of width. The smaller branch above it still needs to grow to fill that gap. The three branches going almost straight up is also disturbing on the eye. What cannot be seen here is that the tree has very few back branches which means very little depth. Skip seven months and this photo is from the other side. A back branch has now been pulled down by the guy wire and the second branch on the left (previous photo right) is filling in nicely. This photo was taken in December 2014. 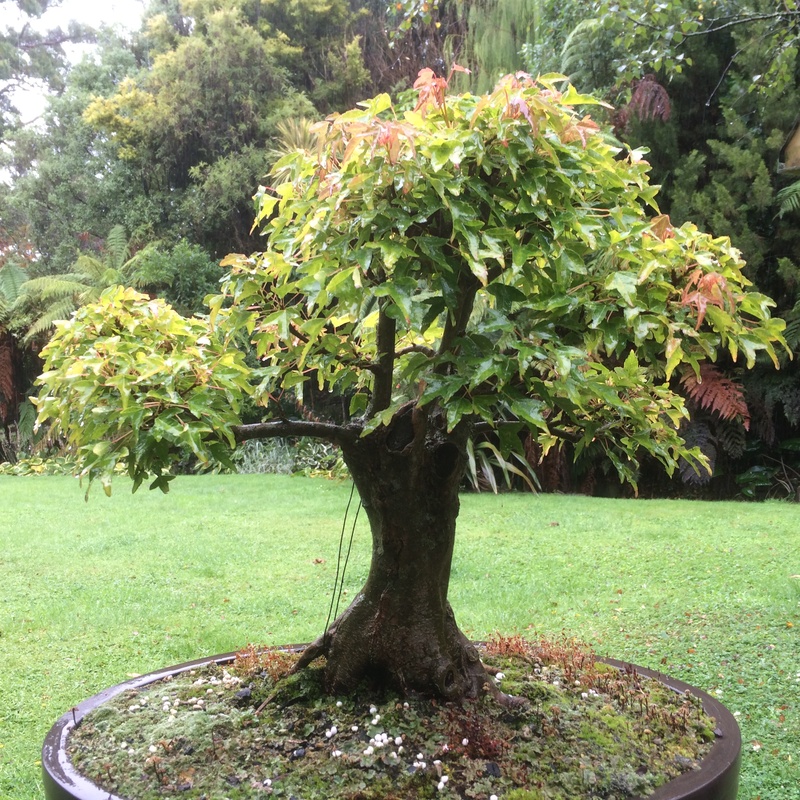 There is now more width to the tree, but the vertical branches making up the apex have not been sorted yet. 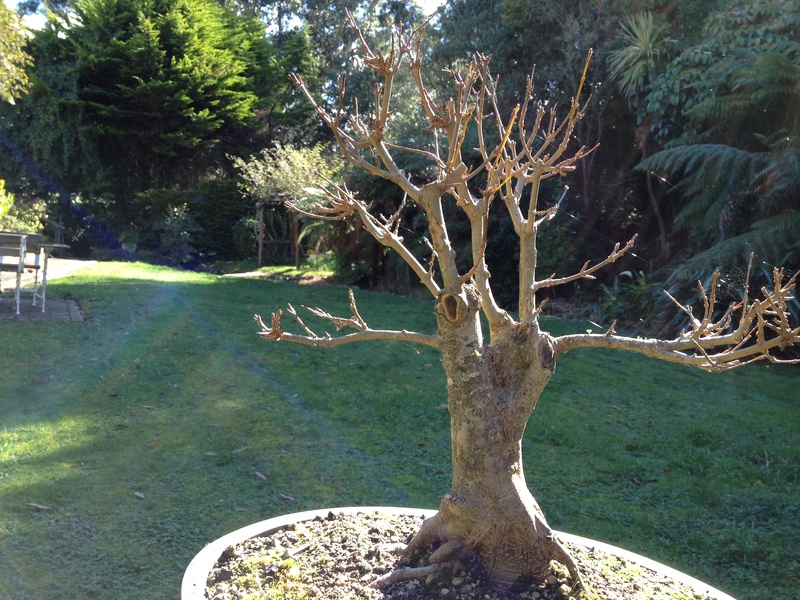 That is the next phase of development, a repot come spring and that will be in a smaller, more appropriate pot.